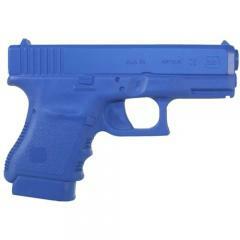 This firearm simulator from the Rings Blue Gun line is an accurately molded replica of the compact Glock 30 semi-automatic pistol. It is made from durable, impact-resistant urethane, allowing it to be used over and over again in high-impact training scenarios. The completely inert design is safe to use even for the least experienced recruits. The simulator is also available in a weighted version, allowing trainees to drill with a training aid that feels exactly like the real thing. Its bright blue color makes it impossible to mistake for a working firearm. I am a holster maker and need a blue gun mold for a Glock 30. Will this work for that? Yes - the Ring's blue gun simulators are great for holster making.